FTAC-74x. 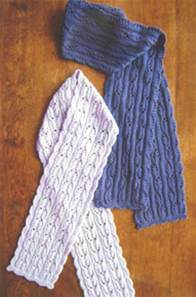 Choose from trailing fuchsia lace or double fuchsia lace for these scarves by Eugen Beugler, both with scalloped edges. Shown in US sport weight (approx DK yarn), 22st to 10cm on 3.5mm needles.